Ketel One Vodka has launched limited edition Arnold Palmer Collector's Edition bottle. The bottle has been launched nationwide, with a price of $24.99 for 750ml and $31.99 for 1Litre. 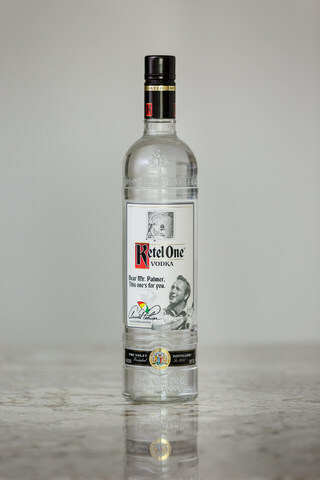 The Nolet family, creators of Ketel One Vodka, has created a limited edition Ketel One Vodka bottle as a thank you to Arnold Palmer for the impact he had on the world and the golf. It is claimed that Arnold Palmer used to enjoy the vodka. He later told Nolet Carl Jr. that enjoying Ketel One vodka after a game gave him time to reflect on life, family and friends. Carl Jr. Said: "Mr. Palmer stood for the same things we stand for as a family: authenticity, integrity and generosity. He set a high standard by making golf what it is today – but it was his accomplishments off the course that truly made him one of a kind." The shared values between the Nolet family and late Arnold Palmer have been cited as one of the main reasons for the vodka-maker to become the Official Vodka of the 2017 Arnold Palmer Invitational. Carl Nolet Jr. recalls that Palmer once watched him sign bottles of Ketel One for consumers. Joking about Carl Jr.'s illegible scrawl, Palmer said:"How would someone know this is your signature five years from now?" Palmer explained that signing something meaningful for others is a privilege; he felt that honour so deeply that he made his own signature a part of his logo. Carl Nolet Jr. claims that he has kept this advice in mind and signs each bottle of Ketel One with purpose and pride for consumers and bartenders. Image: Arnold Palmer Collector's Edition bottle by Ketel One Vodka. Photo: Courtesy of Ketel One/PR Newswire.